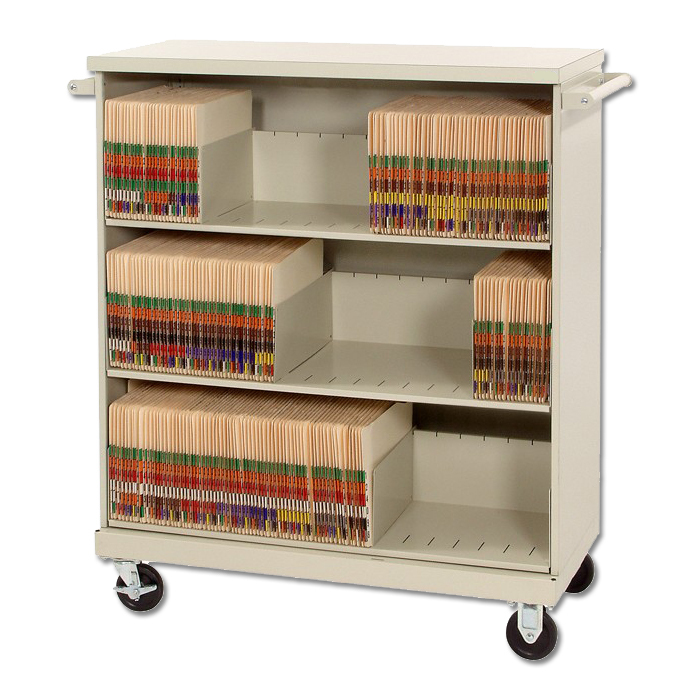 Charts & Carts offers a complete line of medical file folder carts. Included is our popular locking HIPAA compliant cart with a tambour door. Most of our carts can be shipped via UPS for added savings. Designed for end tab folders. Casters are included for easy gliding on any floor surface (two of which lock to keep the cart from unwanted rolling). Mobile File Cart - Top Seller! SKU # FC-2TOP. Convenient workstation helps make filing a snap! SKU # TFC-2TD, Ultimate in convenient patient privacy. SKU # DMRC-3L, Three (3) shelves of generous file space! SKU # FC-8245, Platinum Color - Each shelf offers a generous 24″ of shelf space! SKU # FC-9245, Platinum Color - Four shelves of generous shelf space!